UPDATED, Feb. 27, 2011 — The Catholic Church announced Feb. 26, 2011, that Osvaldo González would be released and deported to Spain. 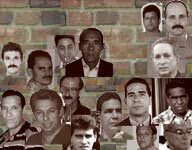 Osvaldo González Montesinos' name isn't on the list of 52 Cuban political prisoners reportedly to be released by the Castro dictatorship under a deal it has struck with the government of Spain and the Catholic archbishop in Havana. But maybe the regime should add it, if only to silence a man who has used his time in prison — he was sentenced in December 2008 to 3 years in prison for "disrespecting the head of state" — to report on and to denounce the abuses he has witnessed. "In the punishment cells, which are very cold, they remove the mattresses at 5 a.m., which is a real torture. At this time, it is very cold, but they do not give you a little more sun, only 30 or 45 minutes, which I think is a real abuse. In the "Naves," where we are forced to live, it is very cold and very humid. We could get sick at any moment. "Health and vision care are very critical, but the director of the prison and the guards don't care. "I have described the 'wonders' of our prisons, but our rulers are concerned only about appearing before national and international opinion as 'angels of God,' when in fact they are evil-minded leaders determined to keep Cuba in the gloomy darkness." There are many in the Castro gulag like González, who see their time in prison not just as punishment for what they did before they were arrested but as an opportunity to take their struggle to a different level. Each and every one is a hero.